Nicols Fox moved to the Radio Quiet Zone to escape electromagnetic forces. “Refugees of the Modern World: The ‘electrosensitive’ are moving to a cellphone-free town. But is their disease real?” by Joseph Stromberg. 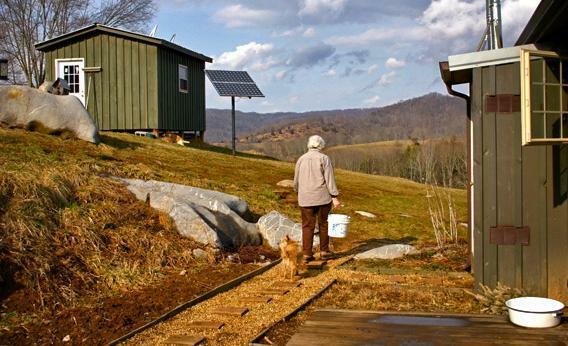 Sufferers of electromagnetic hypersensitivity, a condition unrecognized by scientists, have been moving to Green Bank, W.Va, which lies inside the U.S. National Radio Quiet Zone and is free of broadcast signals and cellular reception. Stromberg visits the community and interviews some of its residents. But is EHS a real disorder, or just a psychogenic illness based on the “nocebo” effect? “Wait, I Have to Know What It Means, Too? : Shame on the Scripps National Spelling Bee for forcing contestants to memorize definitions,” by Stefan Fatsis. Only six weeks before this year’s annual Scripps National Spelling Bee, the Bee’s organizers have decided that contestants will now need to know the definitions of the words in addition to their proper spellings. Fatsis criticizes the decision on the grounds that it turns the Spelling Bee into just another standardized test. “Small Victories: Why Democrats are ready to declare a gun bill—any gun bill—a big win,” by David Weigel. Gun control advocates are cheering a new compromise deal between Sens. Pat Toomey and Joe Manchin on background checks. Yet issues like assault weapons and magazine clips remain unaddressed. Weigel explains that Democrats view even a limited compromise as a tactical setback for the NRA, one that could lead to further gains down the road. Nevertheless, the threat of procedural holdups and NRA-backed amendments from Republican senators still looms. “It’s Always Campaign Season: Why election season begins the day after the election,” by John Dickerson. What is the real lesson of the Mitch McConnell recording “scandal”? That “[w]e are in the era of the permanent campaign.” Dickerson writes: “Suggesting a politician is worried about the next campaign is like accusing them of giving a speech.” He demonstrates that despite rhetoric to the contrary, policy decisions on issues like immigration and gun control are almost universally settled on the basis of electoral concerns. “Scrap the Corporate Income Tax: It can’t possibly be ‘reformed,’ so let’s just get rid of it,” by Matthew Yglesias. Companies like General Electric and Apple have become skillful at shielding their profits from corporate income tax through loopholes and offshore accounts. Rather than closing the loopholes, Yglesias argues that it would be better to scrap corporate taxes entirely, replacing the revenue via taxes on dividend income or a raise in the payroll tax cap. “Animal Personalities: Why are some orangutans so happy-go-lucky?” by Lee Alan Dugatkin. Recent studies show that human societies are not unique in having different personality types. Animals like cats, dogs, and pigeons have different “animalities,” which map very closely to human patterns. Dugatkin writes about how studying animalities can help us understand the costs and benefits associated with certain animal temperaments. It can even improve our understanding of natural selection. “Accidental Racism: Brad Paisley and LL Cool J have good intentions. That’s not good enough,” by Aisha Harris. Country musician Brad Paisley’s latest foray into racial diplomacy, a joint effort with hip-hop artist LL Cool J, is well-intentioned but incredibly superficial, says Harris. She criticizes the song, “Accidental Racist,” for apparent ignorance of persistent institutionalized racism since the Civil War and for the “jaw-dropping” oversimplification of today’s racial tension as nothing more than a petty grudge match. “For Peat’s Sake: Peat is not a renewable resource. What does that mean for my favorite Scotch whiskies?” by Benjamin Phelan. Peat, a partially decayed vegetable matter which is used in the production of some of Scotland’s most sought-after whiskies, is a nonrenewable fossil fuel that could be readily available for many centuries to come. Nevertheless, Phelan worries that as other fossil fuels become more and more scarce, increased demand for peat from other industries could make peated Scotch a thing of the past. “Will Bitcoins Make Me Rich? : A dispatch from inside the digital currency bubble,” by Farhad Manjoo. Bitcoin, an untraceable virtual currency popular with black marketeers and tech enthusiasts, is experiencing a surge in value and popularity due to much increased media attention. Manjoo speculates on whether the bitcoin bubble is destined for still greater heights or poised for imminent collapse. Elsewhere on Slate, Eric Posner calls bitcoin an unsustainable Ponzi scheme doomed to failure.